Mount the pre-conditioned specimen between the dry and wet chambers. The humidity sensor located in the dry chamber analyzes humidity changes and calculates the time for humidity to increase from the lower preset value to the higher one. The water vapor transmission rate and water vapor transmission coefficient are consequently obtained by periodically system measurement and analysis. 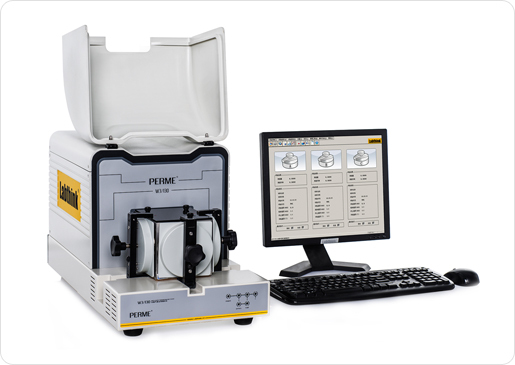 This instrument is based on the humidity sensor method, and is professionally applicable to the water vapor transmission rate test of film specimens. It is equipped with three individual test dishes, and the testing process is completely automatic and conforms to international standards. W3/130 system adopts Labthink's exclusive patent design of three diffusion cells integrated in one instrument for individual or multiple tests, which not only can test individually but also improve test efficiency by 3 times. It also utilizes the embedded computer control system that provides a better performance than traditional single chip system. The instrument can be easily operated by a standard LCD monitor, a keyboard and a mouse; without requiring a PC. The instrument is equipped with Labthink's latest operating software, with user-friendly operating interface and intelligent data management functions. It also supports LystemTM Lab Data Sharing System, which ensures uniform management of test results and test reports. Intelligent guide for test process to avoid mistaken operations. Calibration data recovery function to reduce mistaken operation affects. Mainframe, Professional Software, LCD Monitor, Keyboard, Mouse, Vacuum Grease, Square Sample Template and Valve Set. 2. Customers will need to prepare for gas supply and distilled water(HPLC grade).